Growth Habit: Fennel is a bright green herb with feathery, leaves that smell like aniseed. Flowering stems up to 2.5 m high are produced from the centre of the plant each spring. It has a stout branched taproot and grows best in open, unshaded situations. Type of Plant: Perennial, edible herb. Flowers: At the end of each flowering stem there is an umbrella of small greenish yellow flowers. Fruit/Seed: Aromatic seeds replace the small flowers at the end of the flowering stems in summer and autumn. Dispersal: Seeds fall to the ground very near the parent plant. The plant is spread when seeds contaminate agricultural produce, machinery, animal skins and human clothing. Earth moving equipment may drag seeds and pieces of root to new locations. Seeds are moved by water along drainage lines. 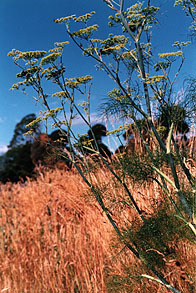 Distribution: Although fennel occurs widely throughout Tasmania it is not considered to have any agricultural importance. 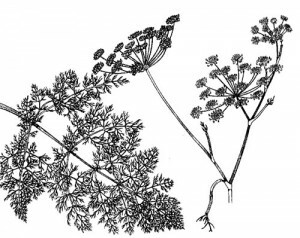 Fennel is usually confined to open, exposed sites like roadsides, railways, wastelands, channels and drains. It is restricted to places where there is available water or runoff. Status: Fennel is a Declared Secondary Weed in Tasmania. However Tasmania also grows a fennel as a commercial crop. Once well established fennel excludes most other plants. This may be due to its unusual chemical properties. Because the plant is deep rooted it can regrow from pieces left after cultivation. Because many people collect fennel roots, leaves and seeds from the roadsides for cooking purposes, a strong dye and large signs should be used to alert the public when herbicides have been in public areas. The distilled oil has an aniseed taste and is used as a food flavouring, for medicinal purposes, in beauty preparations and in air fresheners. In ancient times Fennel was considered to have magical properties. Similar Plants: Care should be taken not to confuse fennel with the highly poisonous Hemlock which has similar growth habits and seeds. For further information on Fennel contact the Department of Primary Industry, Water and Environment Tasmania. Slashing (all year). Slashing prior and over the flowering period will stop further seeding. Also is useful prior to using a herbicide especially if using a wiper applicator. Spraying should be done while the plant is actively growing, but prior to flowering. Seedhead Removal (Sep – Mar). Spot Spraying (Sep – Mar). Herbicides registered for use on fennel include glyphosate (e.g. RoundUp ®, Glyphosate 360 ®), dicamba (e.g. Banvil ®), triclopyr (e.g. Garlon ®) and MCPA (e.g. MCPA 500 ®). Each product’s label should be carefully consulted for quantities to be used. Wiping (Oct – Mar). Glyphosate-based products may also be used in a weed wiper. Generally, a mixture of 2 parts water to 1 part glyphosate herbicide is used. Addition of a surfactant is useful, depending upon which glyphosate product is used. Refer to the label for current recommendations. This info available as a PDF (350 Kb) – click here.